Quality gel pencil eye liners have certainly been on the minds of beauty editors and bloggers for a while now, and while there are continually more flooding the marketplace trying to claim pride of place in every makeup enthusiasts makeup bag-- we all know they are not created equally. I found love at first swatch when I started using Painted Earth's SuperWear Gel Liner in Baroque (initially reviewed here), and now have the pleasure of sharing all of the available shades. This gel eyeliner is the ultimate smooth, smudge-proof easy to apply eye liner formula. Intense color pay-off, long-lasting, excellent coverage and an extremely high-shine effect. Super moisturizing and hydrating ingredients, including Vitamin E and Jojoba Oil, give the pencil a very soft and smooth application. No touch-up is required. Top to Bottom (Left to Right): Noir, Mystic, Sienna, Baroque & Florentine. Noir is a rich ultra-pigmented black. Mystic is a shimmering gun metal gray. Sienna is a rich dark brown. Baroque is a stunning rich golden bronze with a slight olive green undercurrent. Florentine is a breathtaking purple. Painted Earth SuperWear Gel Liners are unquestionably among the very finest on the market, and they rival the quality of luxury brands at a fraction of the price. All five colors boast outstanding pigmentation, intense color saturation, soft and creamy smooth application and superior wear-time. Furthermore, the moisturizing formula is kind to the eyes, but surprisingly the emollient formula does not encourage transfer or smudging. I have found that once the liners set they don't budge until you remove, but if you have oily eyelids your wear-time may vary. Look at the beautiful deeply saturated colors! Ingredients: Cyclopentasiloxane, C11-12 Isoparaffin, Paraffin, Polybutene, Simmondsia Chinensis (Jojoba Seed Oil), Hydrogenated Cotton Seed Oil, Ceresin, Ozokerite, Microcrystalline Wax (Cera Microcristallina) Carthamus Tinctorius (Safflower)Seed Oil, Tocopherol, Glycine Soja (Soybean) Oil, Persea Gratissma (Avocado) Oil, Ascorbyl Palmitate, Calendula Officinalis Flower Extract, Persea Gratissma (Avocado) Oil, Unsaponifiables, Aloe Barbadensis Leaf Extract, Tocopheryl Acetate. Overall Assessment: Painted Earth SuperWear Gel Liners are breathtakingly beautiful and long-wearing eyeliners of extraordinary quality. If you love gel eyeliner pencils, then you owe it to yourself to add these beauties to your collection-- you won't be sorry! $18.50 each from Painted Earth (Unaffiliated Links). So, further to my comment on the painted earth cake liner post... more squeeing (is that a word?) is happening right now! 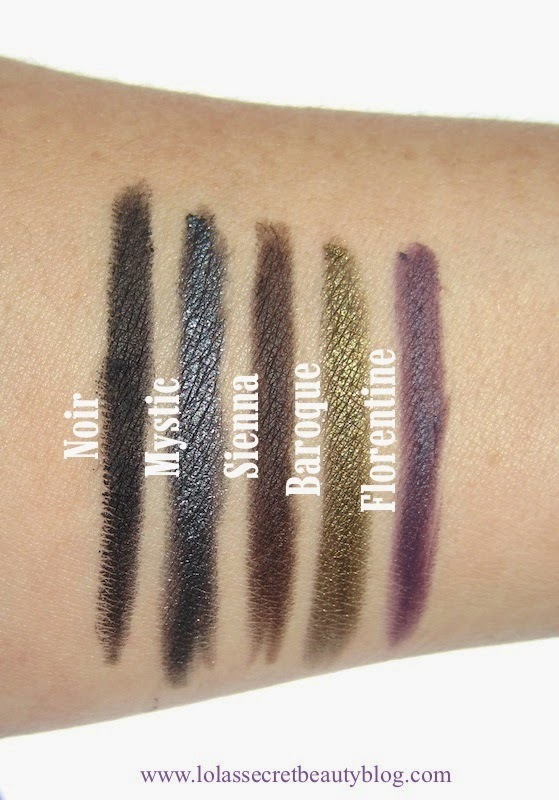 I am obsessed with UD's liners, but that doesn't stop me appreciating these, especially Baroque and Florentine! Mystic is also pretty cool, actually, since the gunmetal I own (UD Uzi) is much lighter than this one.